Since the late 1970s it has been possible to provide incipient fire detection in an ever-more diverse range of applications. Generally speaking, this has provided a high degree of protection for the entire area, but with very little ability to pinpoint incident location. For the first time it now becomes a realistic proposition to apply dedicated detection for areas which may have been borderline decisions for Incipient Detection technology in the past, or for small rooms and critical value equipment. Stratos-Micra compliments both conventional detectors and other aspirating detectors such as the Stratos-HSSD system. 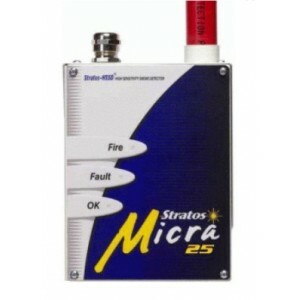 Stratos-Micra (and Stratos-HSSD) are easily the most sensitive smoke detectors available. Furthermore, when such a detector is applied to small volume enclosures or areas, the effective sensitivity of the system becomes proportionately greater. The benefit is the very earliest warning possible in the detection area. In common with all AirSense Technology detection products, Stratos-Micra employs our sophisticated and Queen's Award winning Artificial Intelligence system; ClassiFire. This system controls all aspects of the detector sensitivity setting and automatic day/night switching. ClassiFire not only makes commissioning supremely simple and effective, it also allows the system to 'condition' itself to suit the environment in which it is applied on a day-by-day basis, providing unwavering protection. At a diminutive 135 x 175 x 80mm @ 1Kg, Stratos-Micra is by far the smallest dedicated aspirating detector yet produced. Stratos-Micra employs dust filtration and Laser Dust Discrimination LDD™ as a standard feature. This makes the system suitable for a wide range of environments, including; paper/ flour mills, generator areas, telecoms areas, furnace rooms, computer environments etc.